Tourism in Portugal has been growing steadily since 2011 and the country was named one of the top 3 hottest travel destinations worldwide by Lonely Planet and one of the top 5 safest countries in the world for tourists in 2018. Portugal saw a 12 percent increase of foreign tourists in 2017 accounting to a total of 12.7 million visitors and contributing to the strongest economic growth since 2000. Brazilians, British, Eastern Europeans and Russians lead the mix. Enough facts, let’s go surfing! Considering you will probably fly into Lisbon (Lisboa in Portuguese), I suggest we start our exploration with the popular (and hidden) surf spots around the capital. 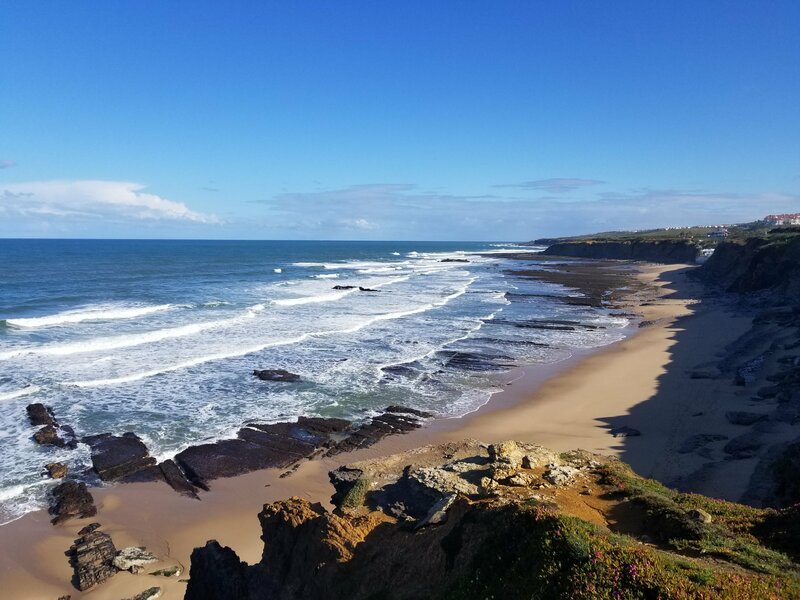 Carcavelos is the go to spot for beginners with many schools offering lessons and rentals in the area. It is a short drive or train ride from Lisbon and with its sandy beach and gentle break is sure to offer you a good time on your first taste of surfing in Portugal. If Carcavelos is flat (it is in the river mouth and not directly on the Atlantic Coast, hence a more mellow wave), head to Costa da Caparica, which responds to a northern swell. If you are in the Lisbon area and need lessons, rentals, or guiding, call Andre from Salty Souls Surf School, he’ll hook you up and give you the inner scoop! His excellent reputation precedes him on Tripadvisor and Airbnb and he can help you with transportation if you are by yourself and unsure how to make your way to the beach. For surfers looking for more advanced breaks on the powerful Atlantic Coast who have their own transport, head west to Guincho or Praia Grande. Read: strong currents and powerful Atlantic swells. Guinco and Praia Grande are world famous spots where many surfing competitions are held. A guide is highly recommended for your first session or at least stop by a local surf shop to ask what peak to surf and where are the channels. Places to stay on the coast close to Lisbon – choose the adorable and convenient (but touristy) Cascais or my favorite tiny village of Azenhas do Mar. Definitely do Airbnb if traveling with a friend or group or you can stay in Ljmonade or F3 hostels in Cascais if by yourself. Both hostels offer bike rentals and additional paddle board/yoga activities. Ericeira is a surfer’s paradise with 4km of breathtaking coast and some of the best waves in the world breaking over the continental shelf. The town even features an Interpretative Center where there is an interactive video of every break in the area and a topographic map of the ocean, the coast, the swells and the wind directions. I wouldn’t dare to surf Ericeira without guiding and that’s where Nuno Goncalves from Ericeira Surf Camp comes in. The man is a local legend having presided over the town’s surfing association and towed pro surfers at Nazare!!! #youbetterbelieveit Even though Nuno is the owner of the camp, his never ending passion for surfing takes him out to teach beginner lessons and to guide more advanced surfers every weekend. Driving up the coast from Ericeira, if you can leave town that is, you reach Peniche and Baleal. “The little fishing town of Peniche is not the prettiest spot on the Portuguese coast, but it’s probably the most renowned surfing area in the country” as Magic Seaweed says. It features over 30 different beach breaks that face various directions and respond to different swells. The famous Supertubos is where the annual MEO RipCurl Pro competition, part of the World Surfing League tour is held. Supertubos is regarded by many as one of Europe’s best beach breaks, but there are plenty of other barrels to pull into around Peniche. The secret spot north of Baleal is Almagreira, where you go either when everything else is super flat….or you are ready to be smashed by some massive waves. Almagreira has fantastic red rock formations on the beach and is the closest to the Ericeira flat reef bottom surfing feel for me. Public transportation (buses, subway, and trains) is very safe, reliable, frequent, and CHEAP in Portugal. Since I was traveling by myself, I couldn’t make it worth it for my budget to rent a car and I used the subway, trains, and local buses instead. (You may need to speak a bit of Portuguese as schedules are tough to understand and there is no sign in English 😦 You don’t need a car to travel between the major cities and having a car in the city is quite a hassle actually since streets are tiny and parking is non-existent. If you decide to rent a car after all, the best deals can be found at the airport thru online booking and discount sites. Be VERY careful when picking up the car to avoid extra charges and being stuck with a lemon. Car rental companies are notorious for trying to keep your deposit any way they can and at >EUR 1000 its a hefty deposit to forego. Voted among world’s top 5 safest tourist destinations, Portugal is very welcoming to tourists whether you are traveling in a group or alone. Still, be smart, not overly trusting when drunk 🙂 and beware of pickpockets, weird looking people down dark alleys at night, and the random drug dealer at the corner that will offer you hash 🙂 Pickpockets are not aggressive or armed but they are magicians with their hands and you won’t notice when or where your phone or wallet has gone missing.